Andy has been in touch as he's needs a master brake cylinder and/or brake servo to fit his 1980 Vauxhall Sportshatch 2L. 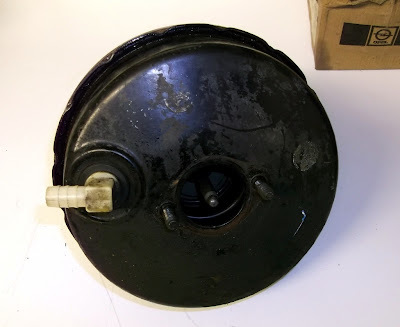 I knew that there was one salvaged brake cylinder in the loft and a matching brake servo too, but as new master cylinders are currently listed on eBay for under £50, I advised going this route unless very cash strapped. Servos seem to last forever, usually only having the shell rust through causes them to fail, which in Andy's case, was exactly what happened to his after the car had been sat for several years before he bought it. I dug out the servo, it was pretty oily but that seems to have preserved it well. I also compared the Haynes manuals for the Mk 1 Cavalier vs. Opel Manta A series and both cars are stated to use a 7" servo with the same amount of boost. Somewhere at the back of my mind I have a feeling that the later Mantas might have used a slightly larger unit. Another long shot Andy is after is a front chrome bumper, for the moment he's had to fit a plastic Opel Manta GTE one and has had real trouble finding the correct chrome item. Can anyone help?